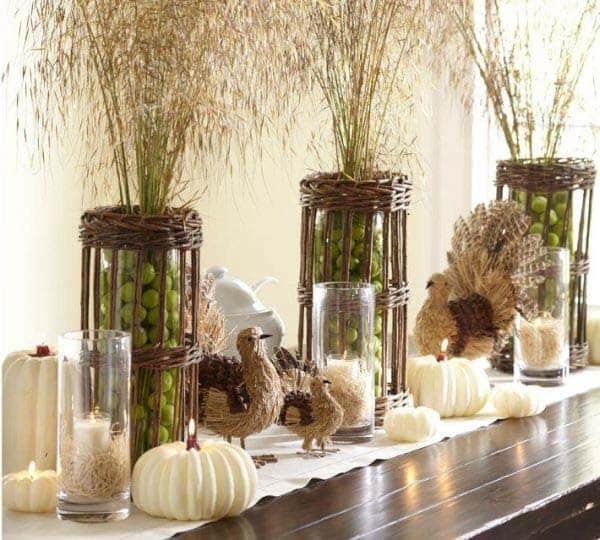 Thanksgiving is around the corner and its time to start planning your holiday table decor arrangement to welcome family and guests over for an unforgettable dinner party. 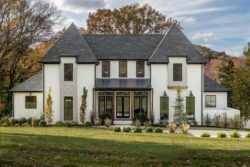 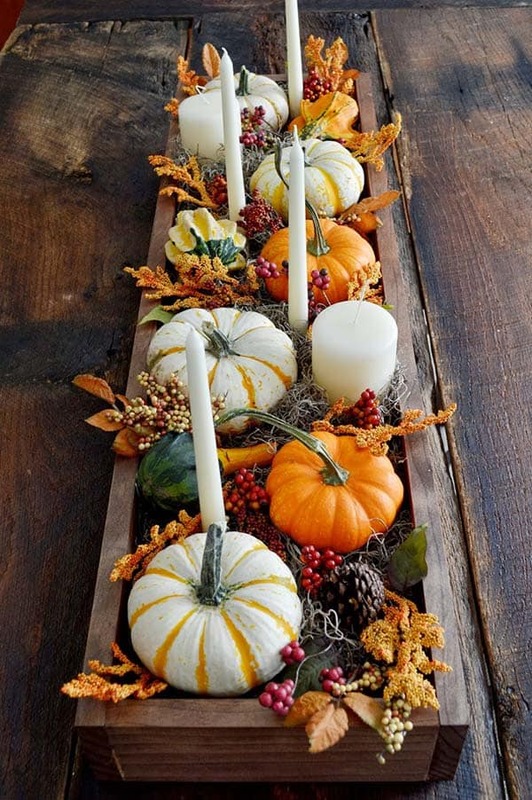 Fall is a time where you need to be infusing your home with warmth, lighting the fireplace and decorating your home with seasonal colors and accents. 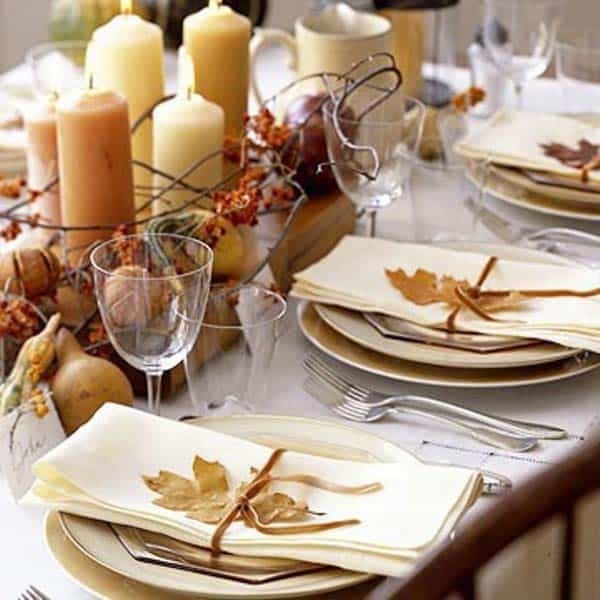 Its time to start planning your holiday dinner parties, from the food to the table decorations, there is a lot to prepare. 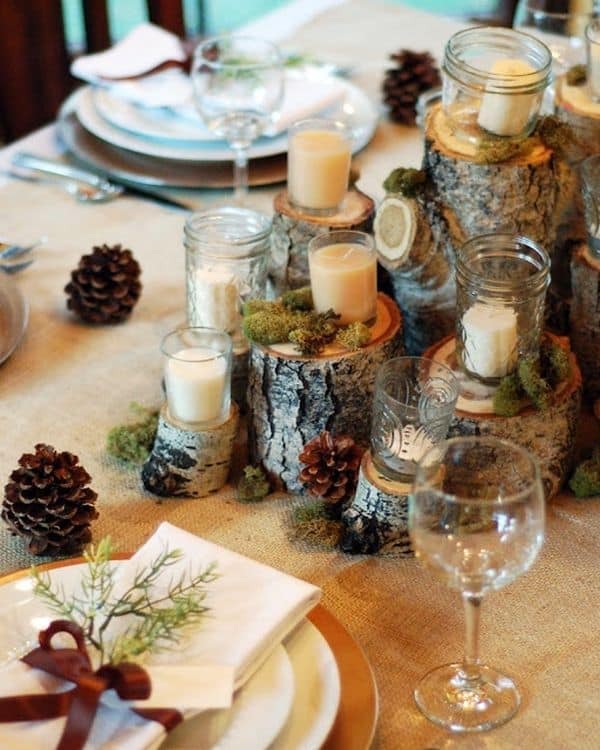 Your table should set a mood, where it be rustic, modern or somewhere in between, it should delight your senses and inspire some creativity. 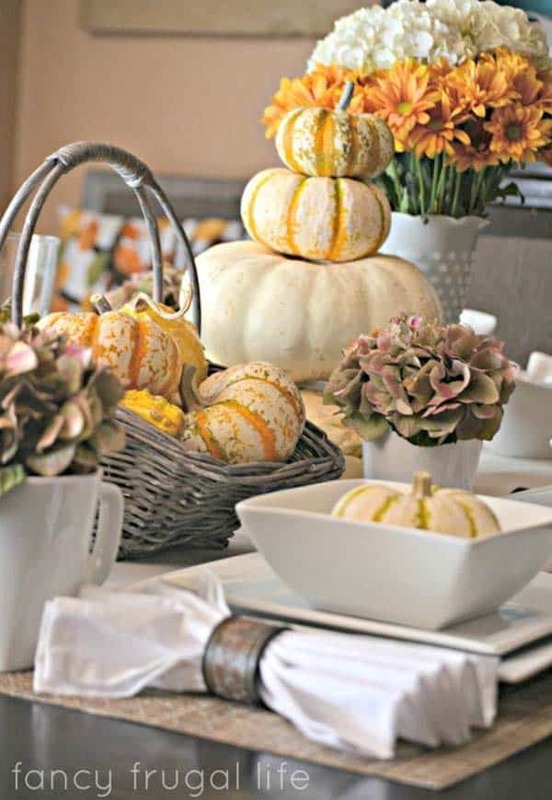 Pumpkins are an ideal starting point for fall decorations, they are easy to get, not too expensive and they are plenty of inspiring ways you can decorate with them. 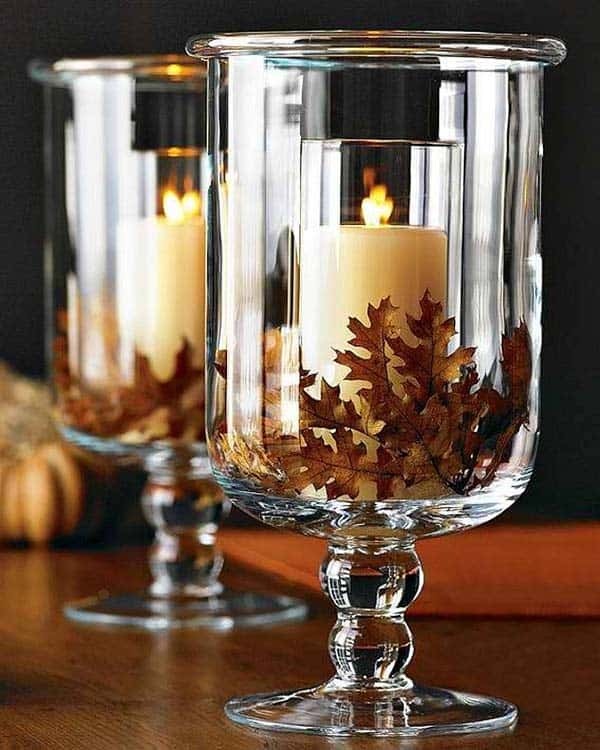 They come in a variety of colors, orange, white, ivory and green and they can also be painted in any festive color you wish. 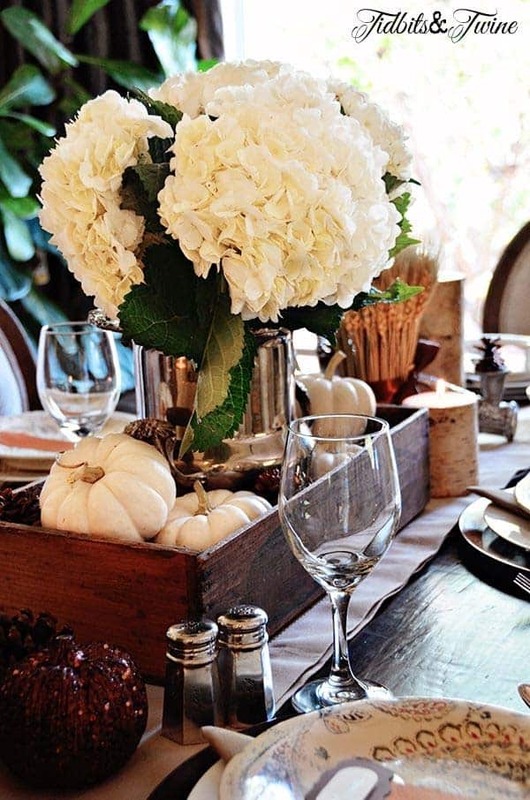 If you want to keep everything contained on your festive table, try using a long wood pallet box (image above) filled with floral foam. 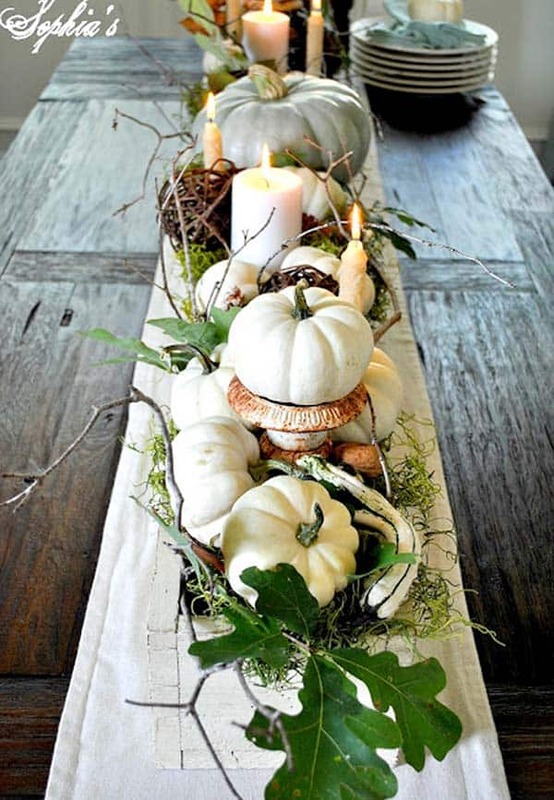 Decorate it with various sized pumpkins, berries, candles and cedar to create a picture perfect centerpiece. 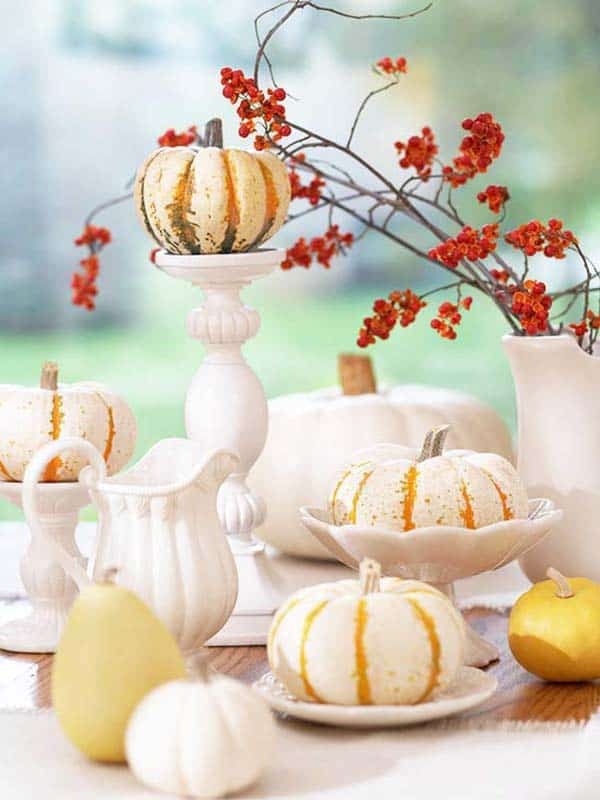 If you are looking for classic elegance, adding white pumpkins to your centerpiece should do the trick. 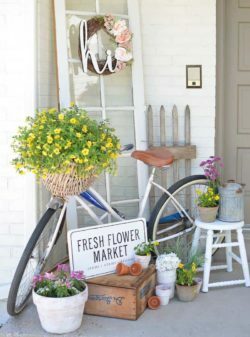 We have gathered together many DIY ideas for you to get inspired with lots of tips along the way! 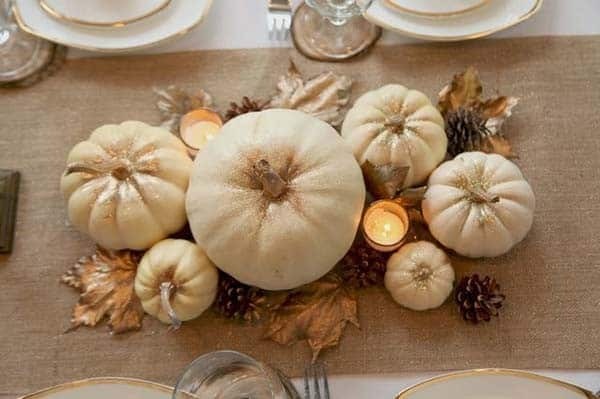 Decorate with Pumpkins: Select light and bright table decor such as white pumpkins to create a beautiful fall arrangement that your guests will love. 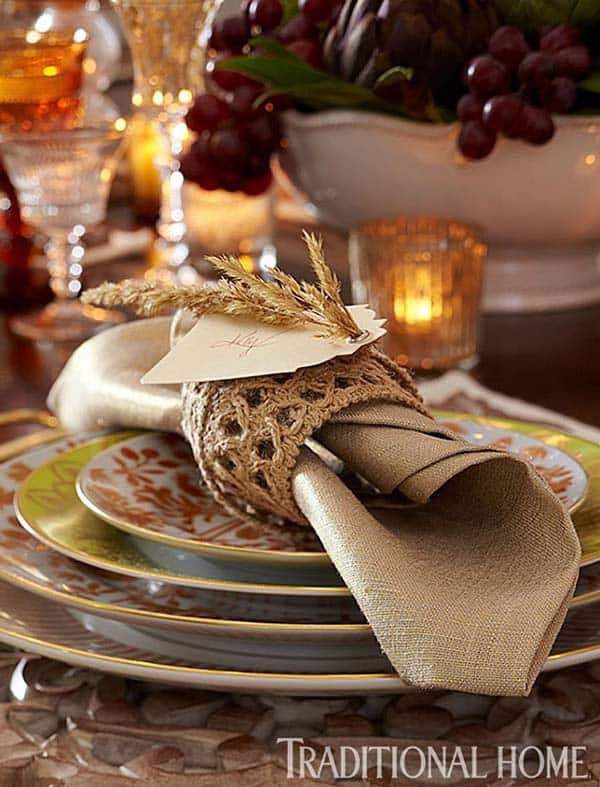 Metallic Table Runner: Infuse your table with holiday glitter by adding a touch of class with gold. 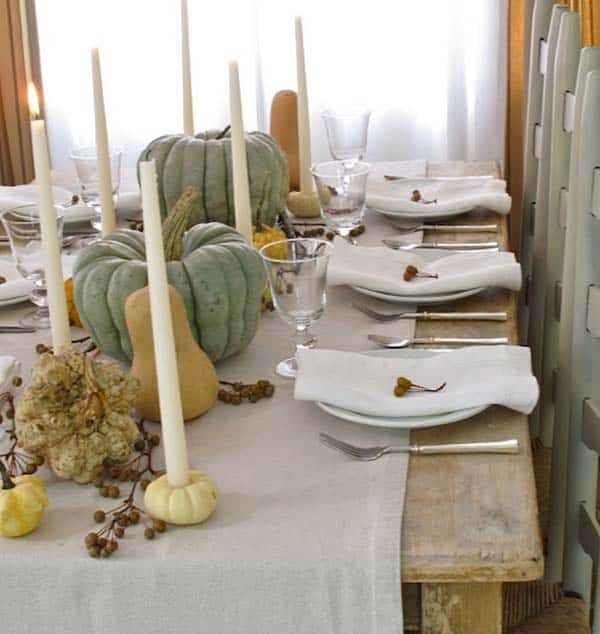 Start with adding some natural texture with a stunning burlap table runner. 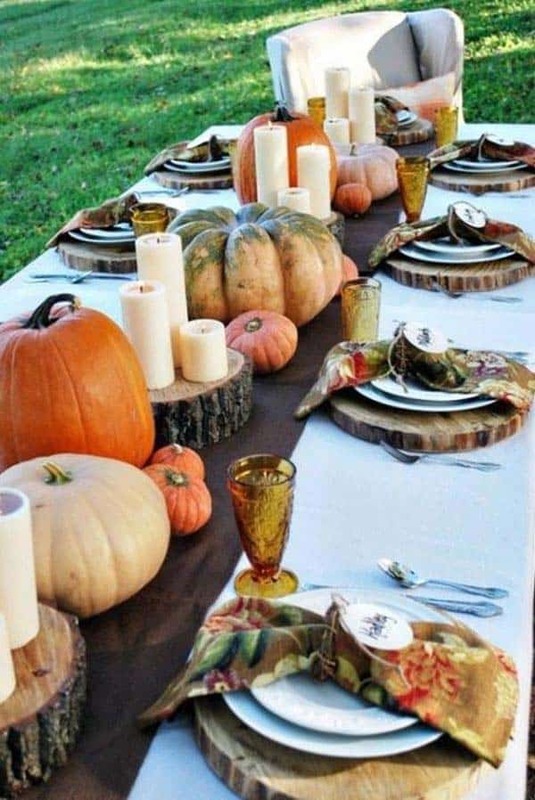 Decorate with pumpkins, branches and pinecones (all spray painted gold), creating a modern and fresh aesthetic with rustic nuances. 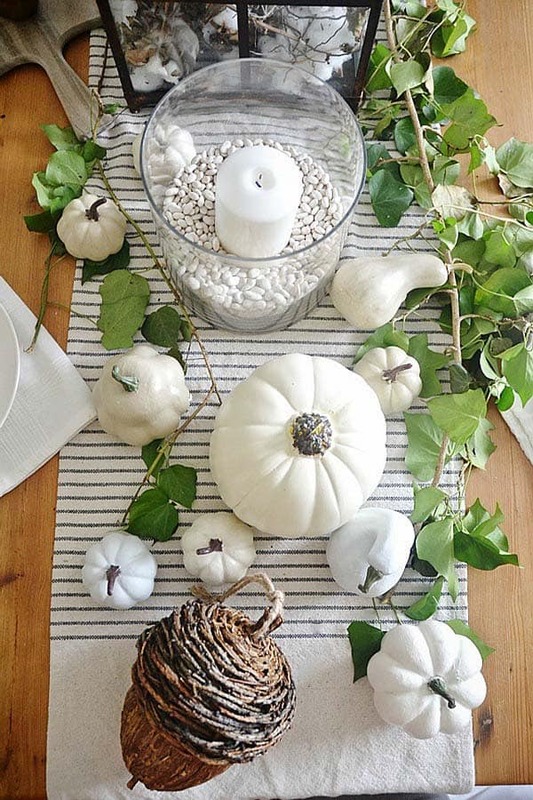 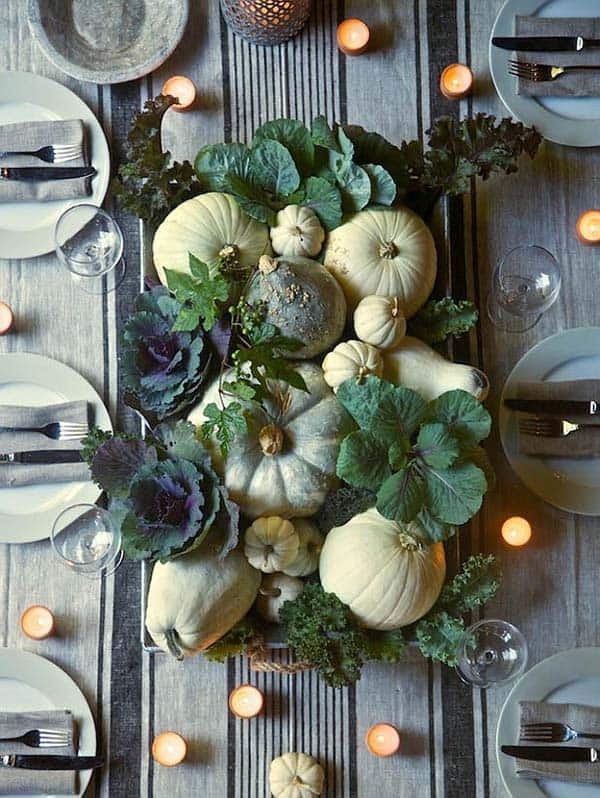 Decorative Table: Add natural touches to your holiday table decor with bittersweet, leaves and gourds. 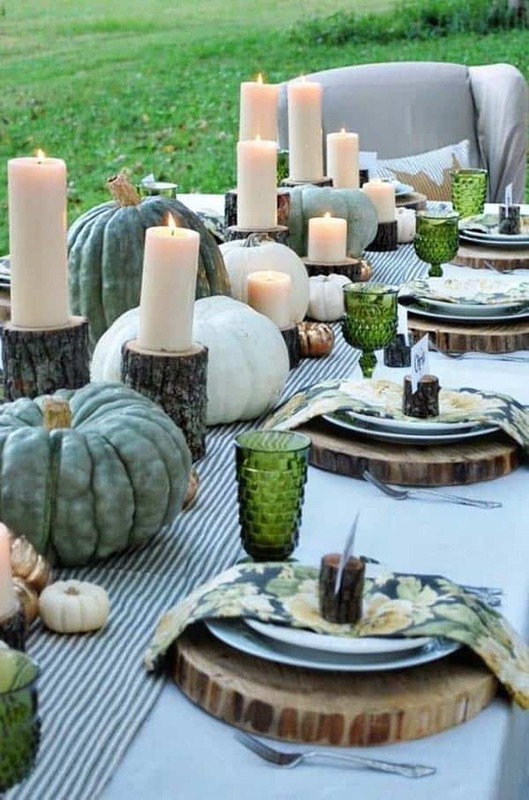 Begin with a wooden plank in the center of your table, add pillar candles in fall-inspired hues or scented candles of pumpkin spice, apple pie, cinnamon, vanilla, etc. 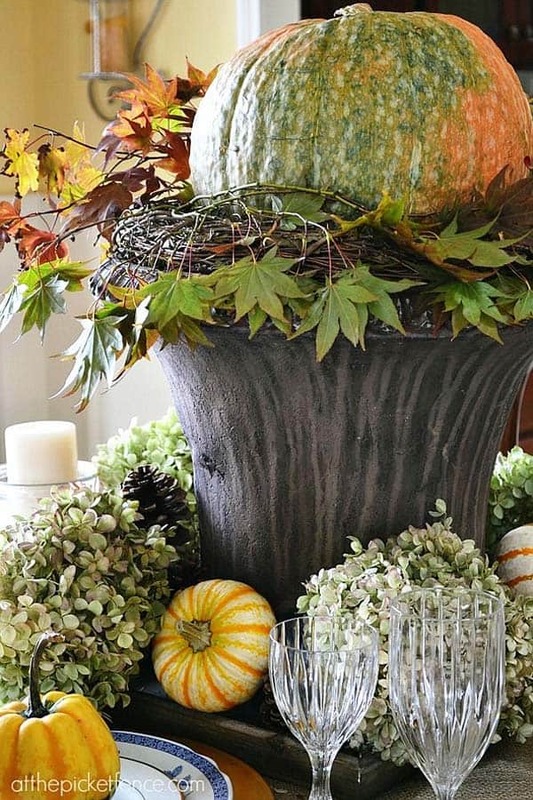 Encircle the centerpiece with gourds, dried berries and vines. 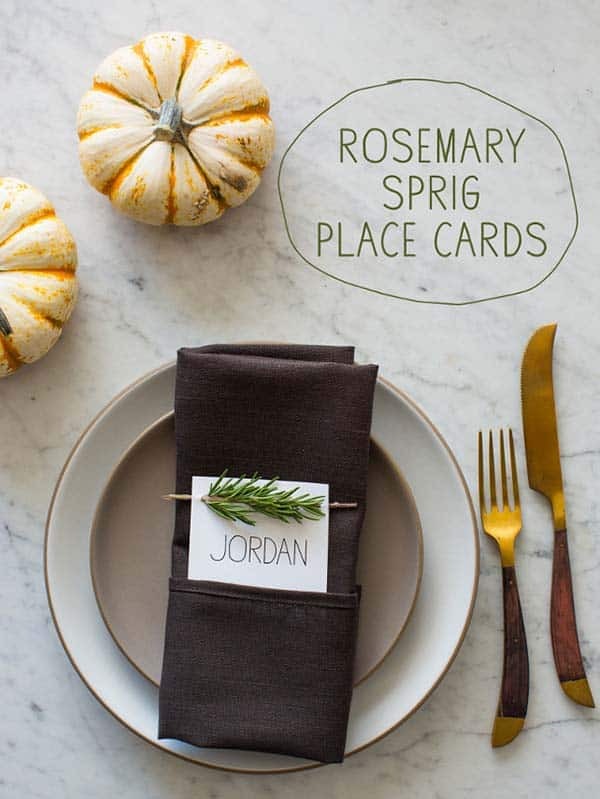 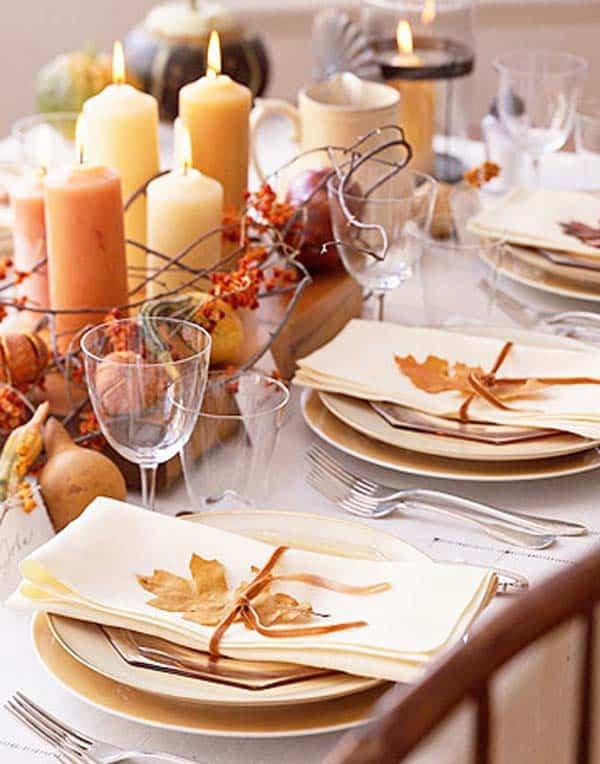 Add place settings in fall colors, topped with linen napkins wrapped with ribbon and dried leaves. 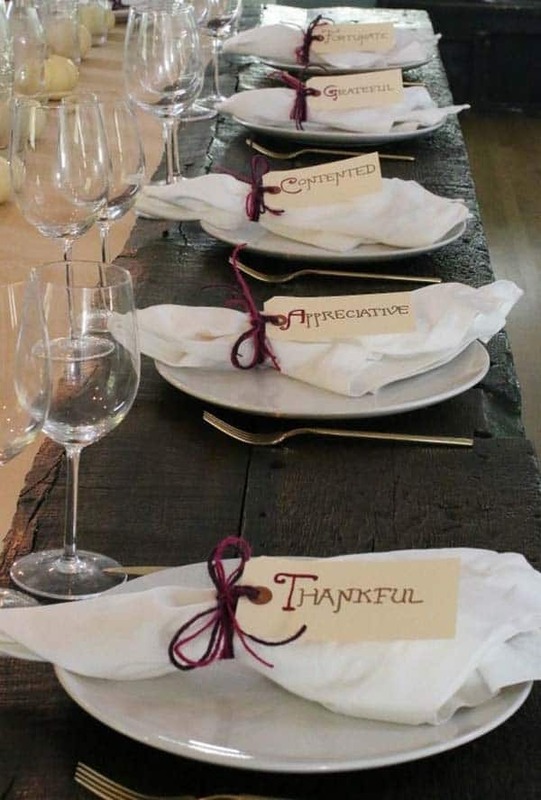 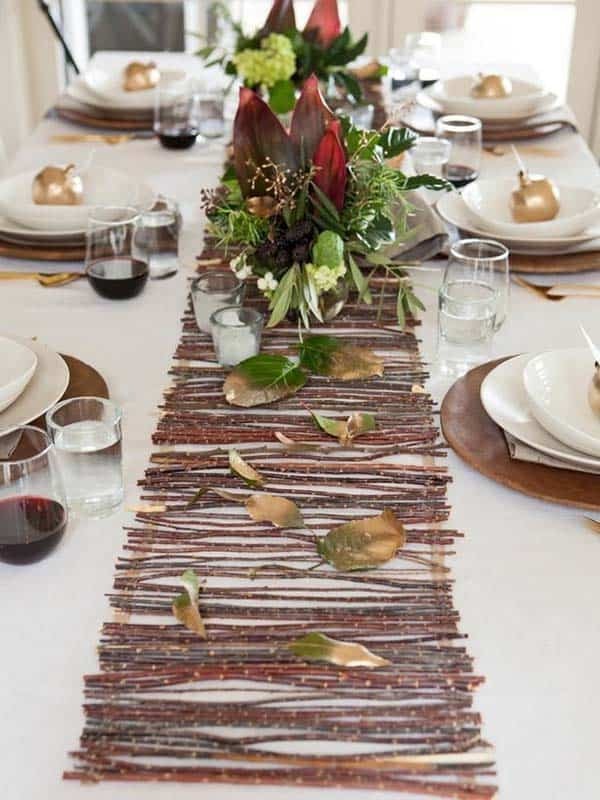 Twig Table Runner: Add organic materials to your table with a stunning table runner comprised of twigs. 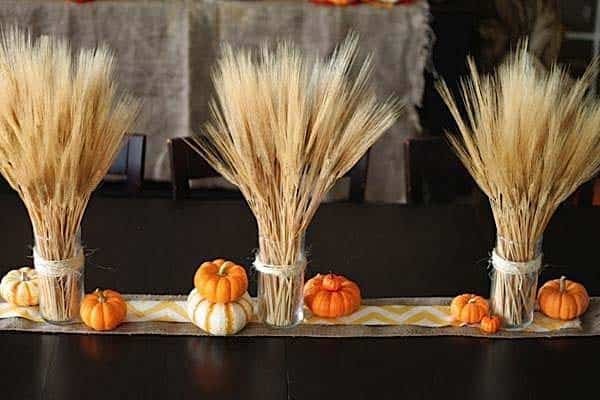 Gather twigs from your yard or purchase them from a craft store. 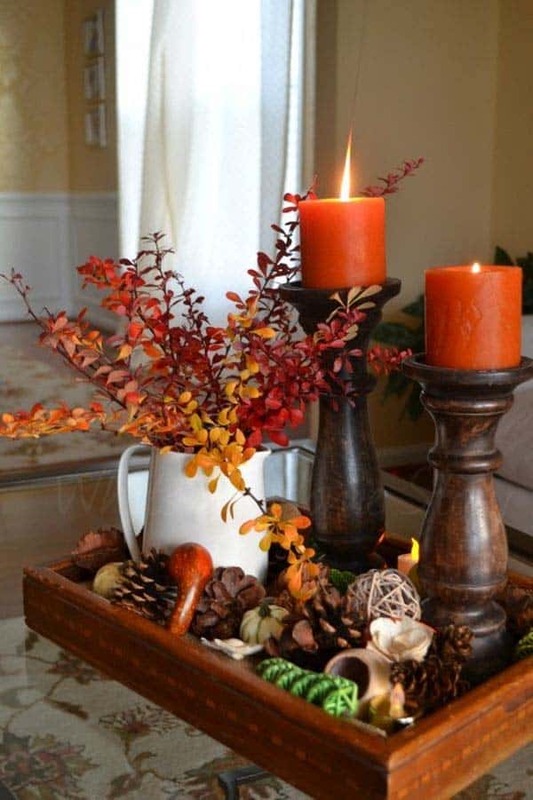 This runner is easy to assemble, get the step-by-step instructions here. 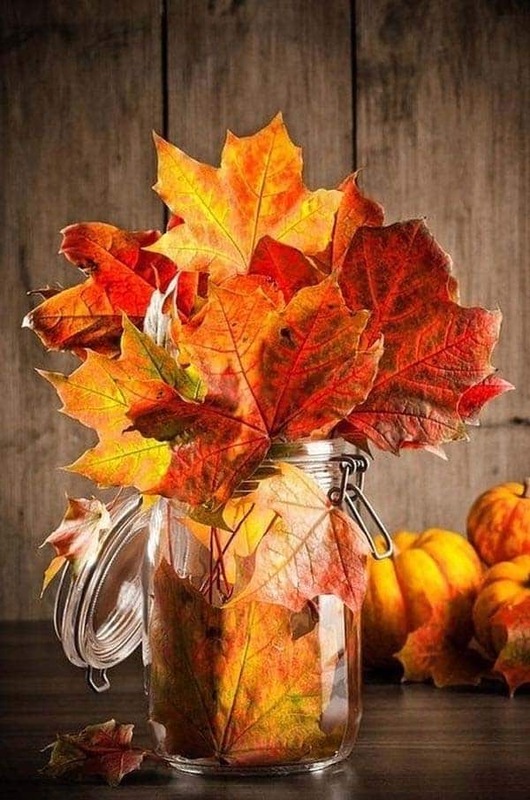 Leafy Centerpiece: Fill a glass jar with fall turned leaves to create an inexpensive centerpiece for your table. 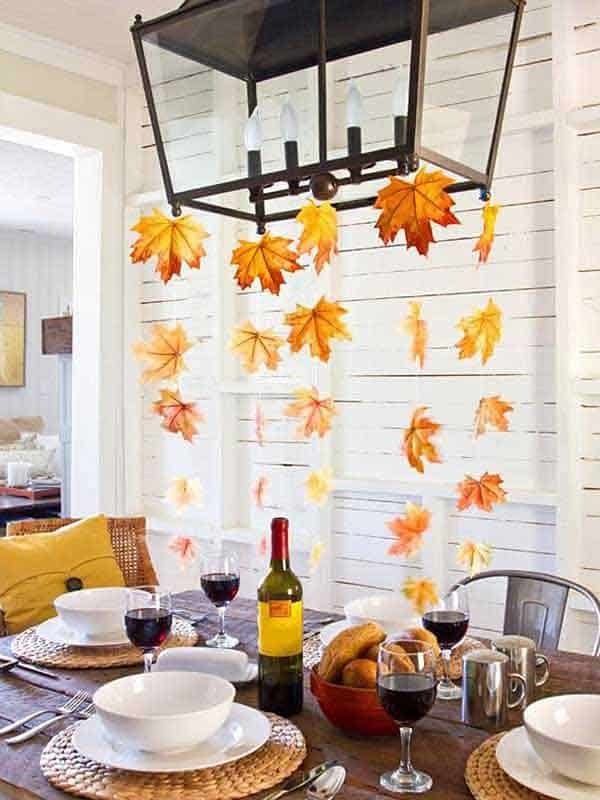 String leaves together and hang them from your chandelier above your dining table for an interesting visual effect. 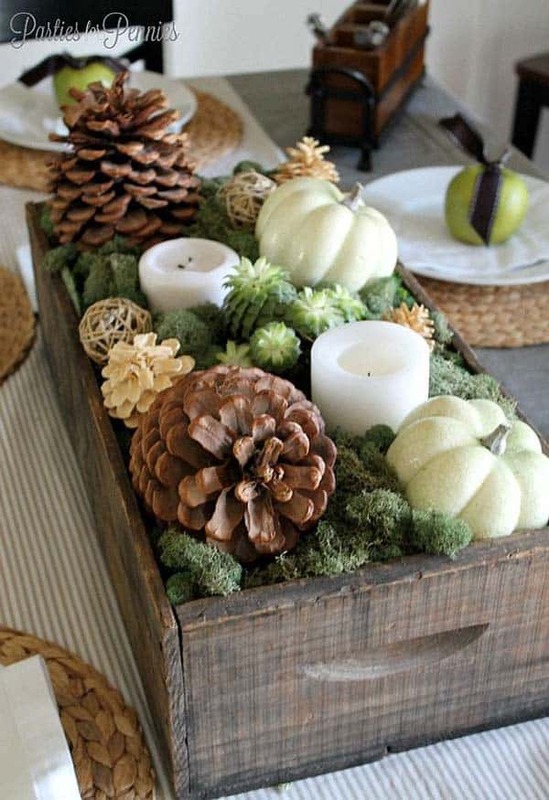 Fill a tray with fall items such as pinecones, potpourri with a harvest scent, pillar candles and a vase filled with flowers or dried leaves. 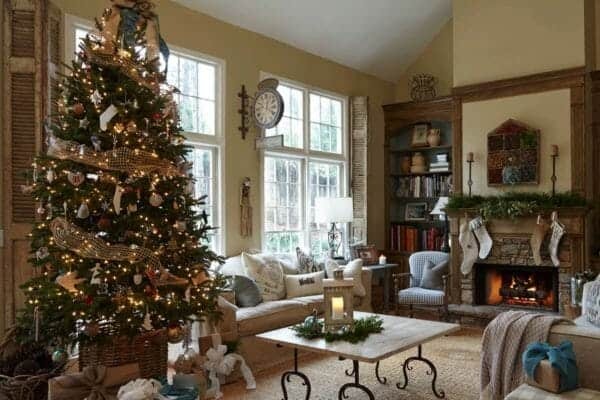 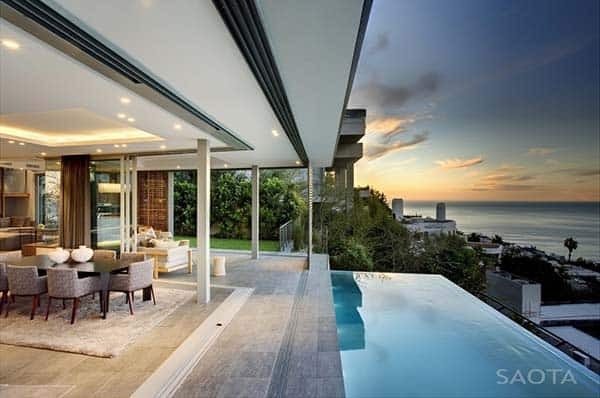 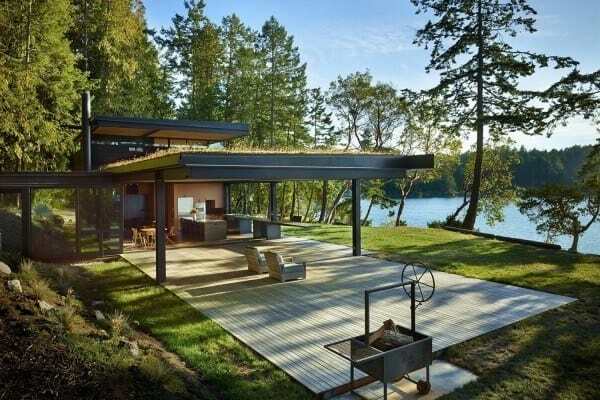 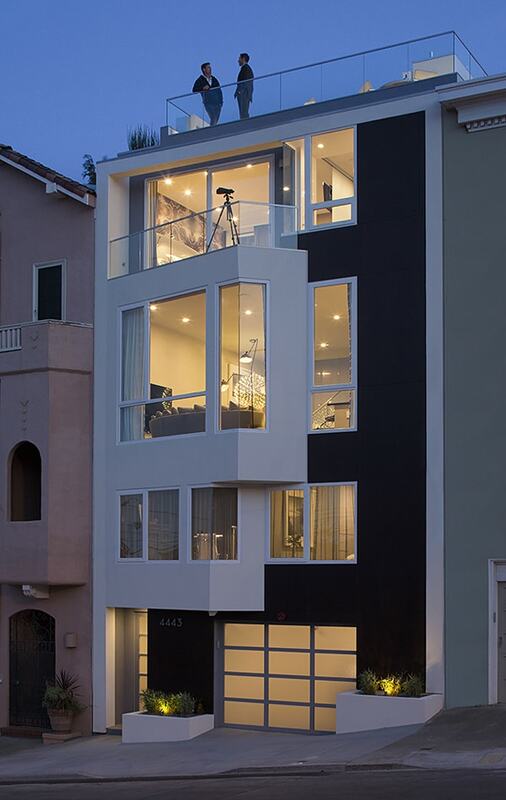 This can easily be moved out of the way if additional space is needed and can be easily changed if you have a new idea! 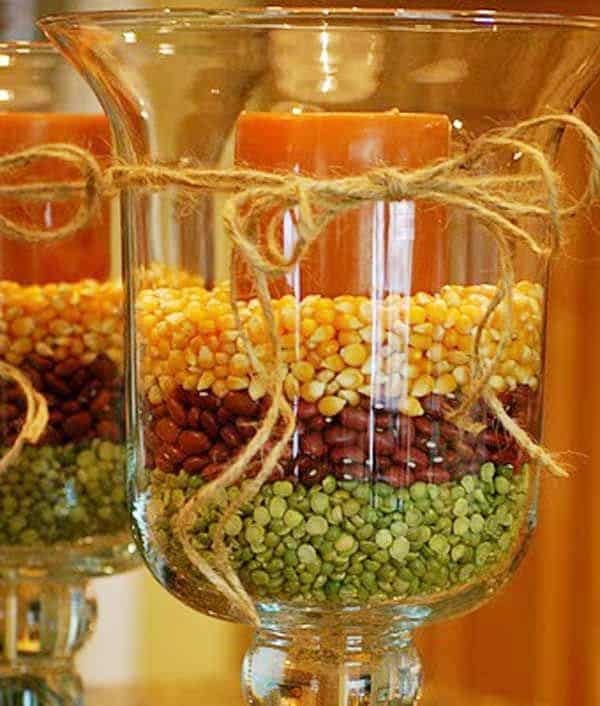 Fill a glass vase with dried peas, red kidney beans and corn kernels for a fresh and innovative display. 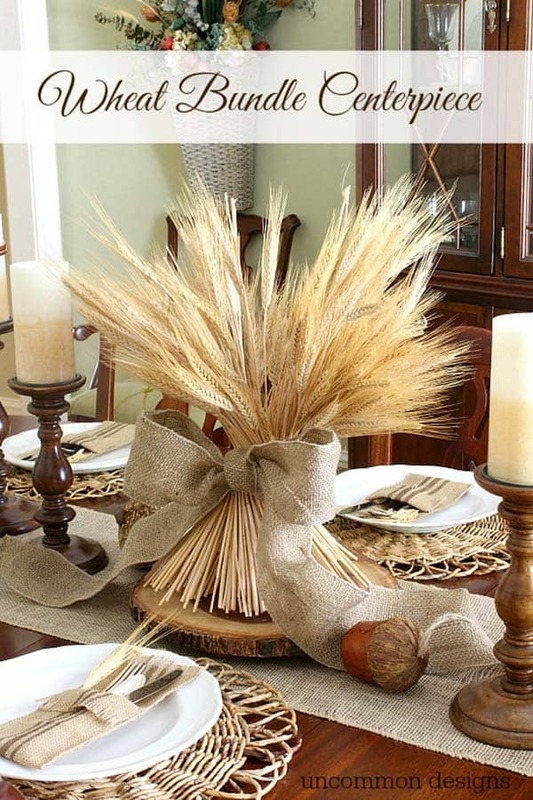 Top with a candle in a harvest color and tie a fresh piece of twine into a ribbon for a finished effect that is very natural. 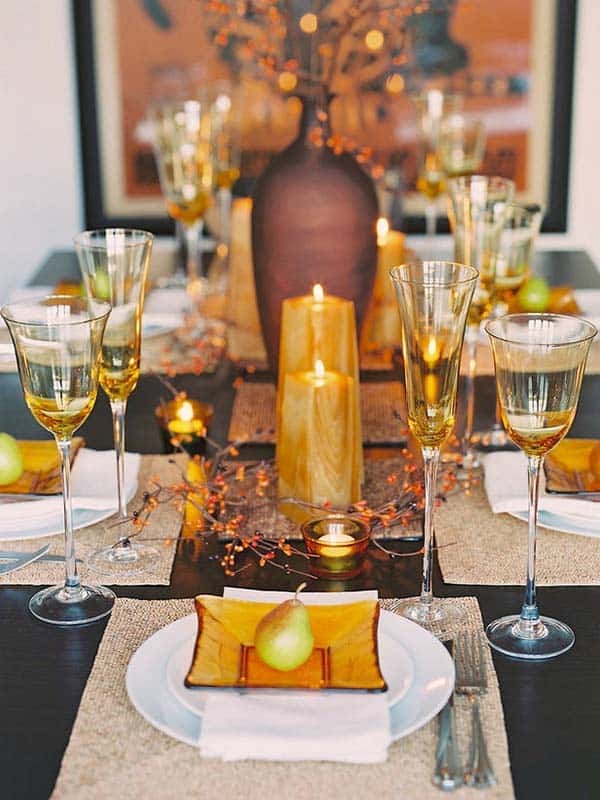 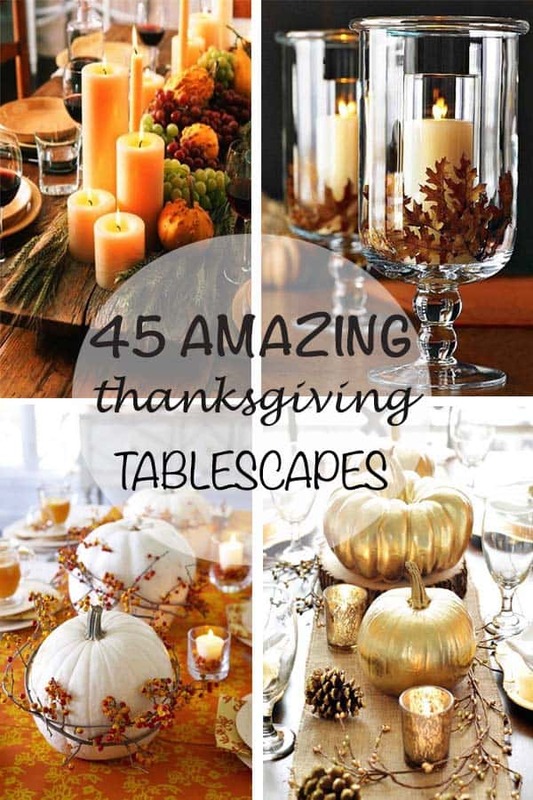 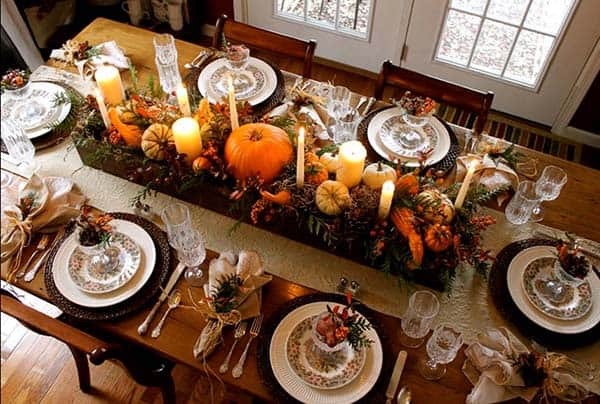 Decorate an Outdoor Table: If you live in a warmer climate, decorate an outdoor table for Thanksgiving. 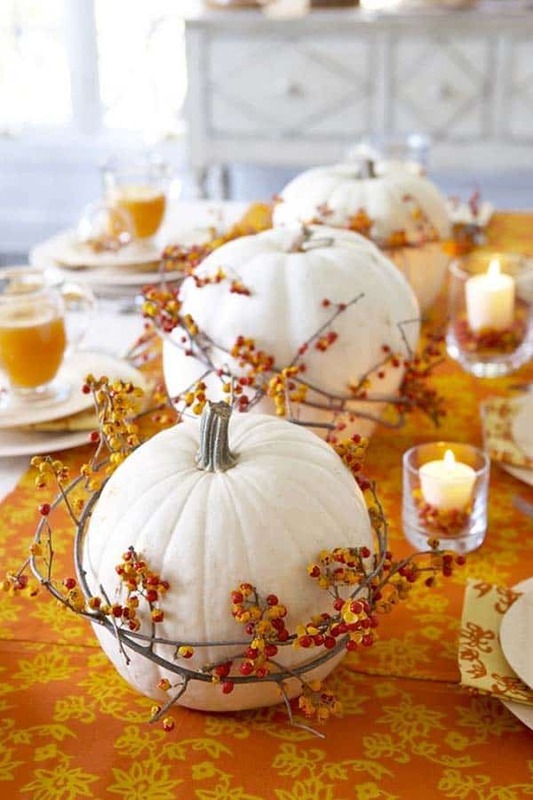 Use natural items such as wood, burlap, twigs, berries, pinecones and of course pumpkins! 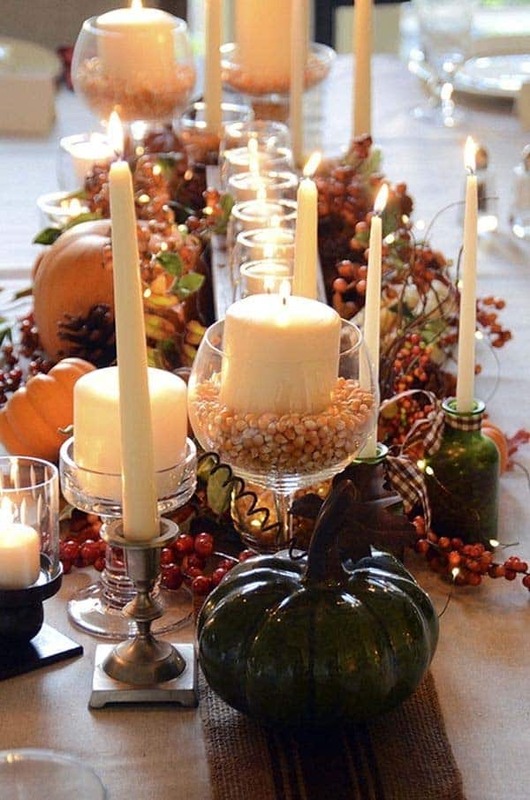 Candle Centerpiece: Candles are a classic way to set the mood at your dinner table, adding a lot of holiday cheer. 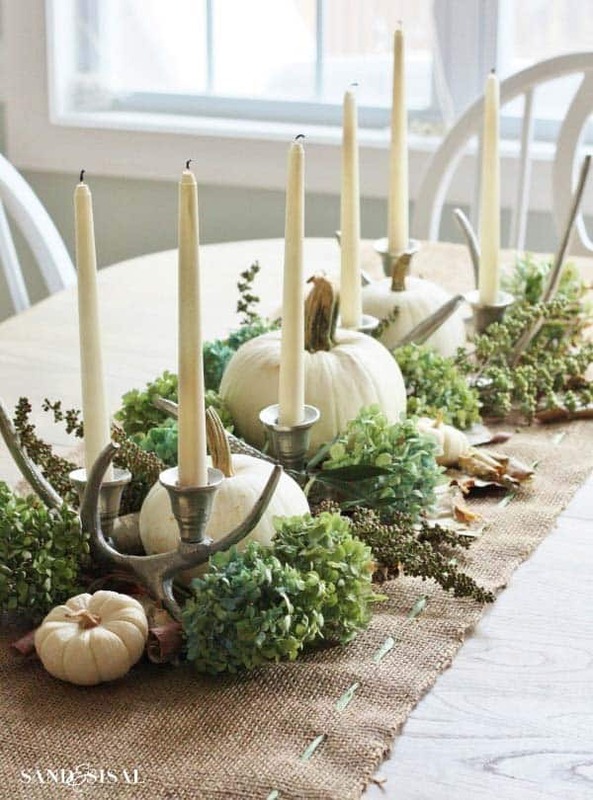 Try grouping 15 or more pillar candles at varying heights on a plate or tray (or a piece of wood as it shows in the image above) in the center of the table. 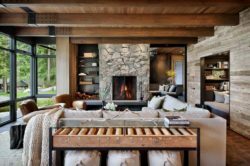 The wood in the image above adds some rusticity to the center arrangement. 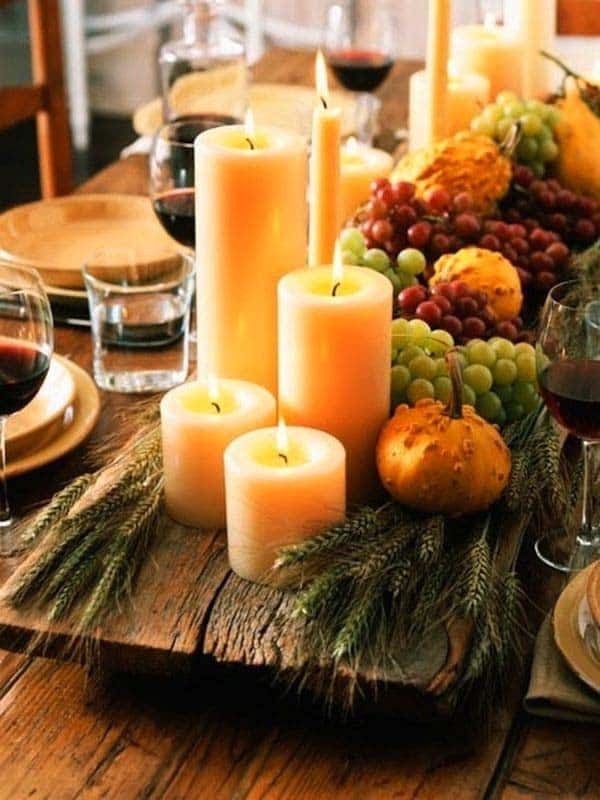 Use unscented candles at your table when food is being served, but place scented candles throughout your home to create a nice ambiance and set a holiday mood. 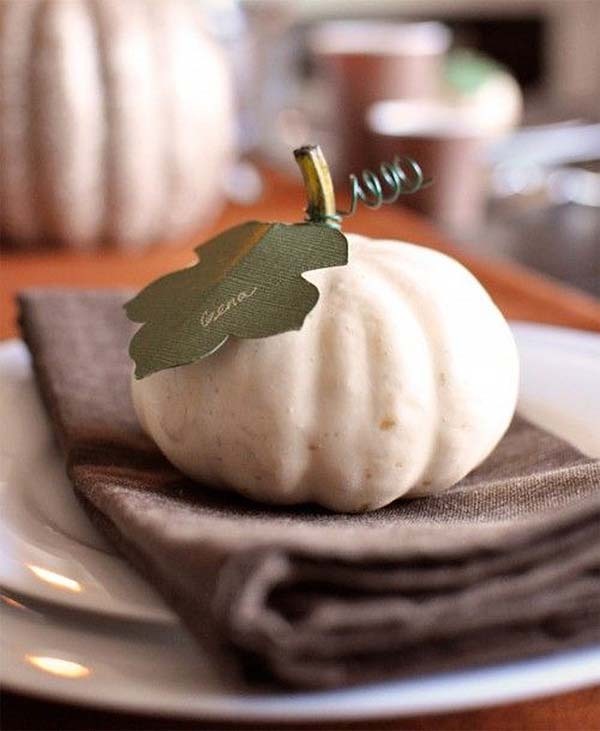 Try scents of cinnamon, apple spice, pumpkin and even sandalwood. 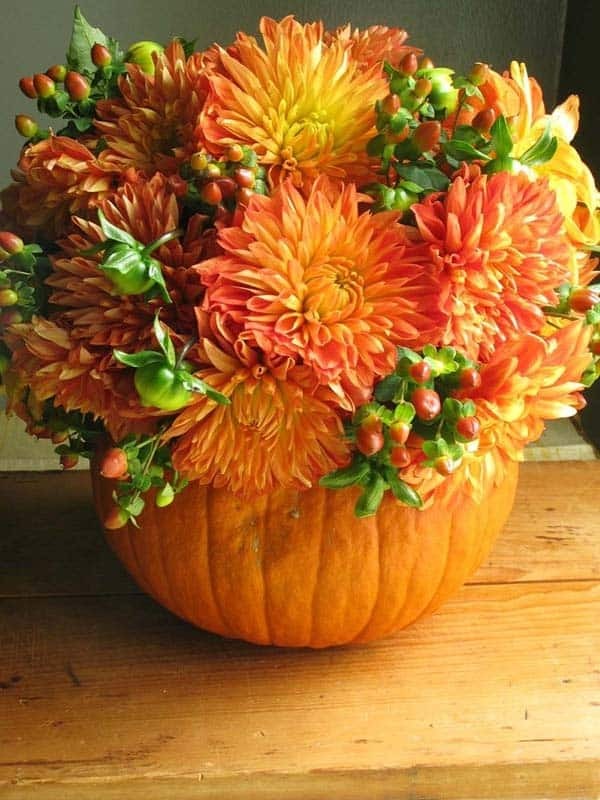 Fill a pumpkin with fresh fall-inspired flowers such as mums and berries. 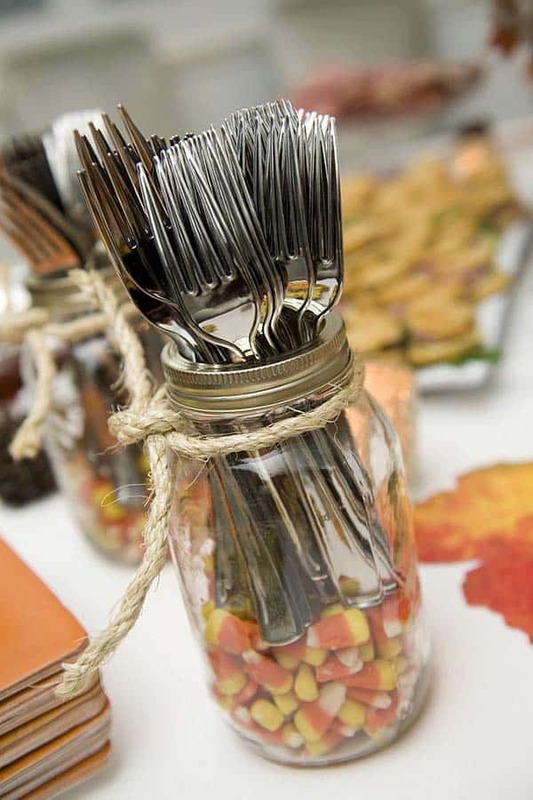 Creative Idea for Cutlery: A clear glass mason jar filled with candy corn can make a nice holiday display to place your cutlery on the table for guests. 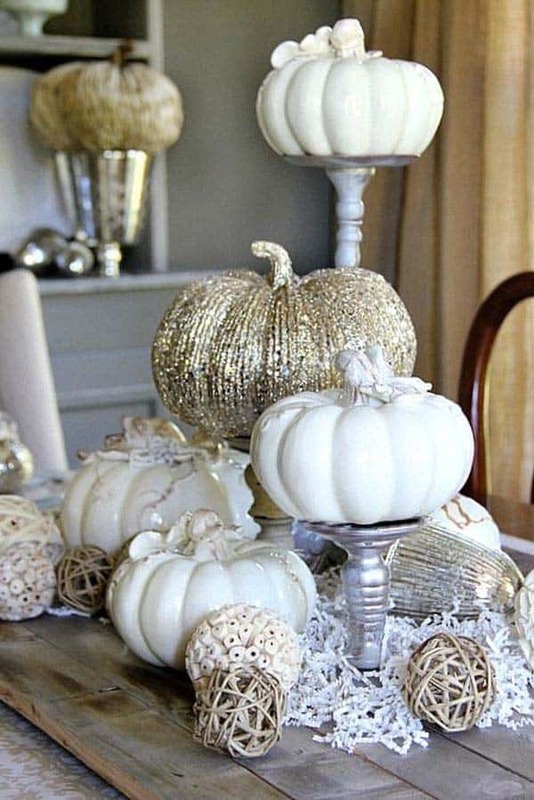 Sparkling and Elegant Centerpiece: This glitzy table display features a ghost white pumpkin in the center accented by large pillar candles and metallic painted gourds. 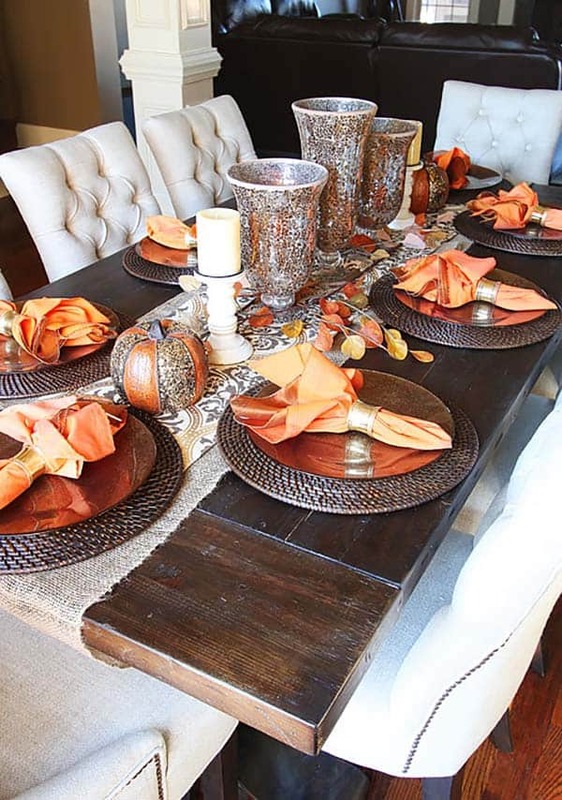 This table reflects a casual and warm feel with a modern twist. 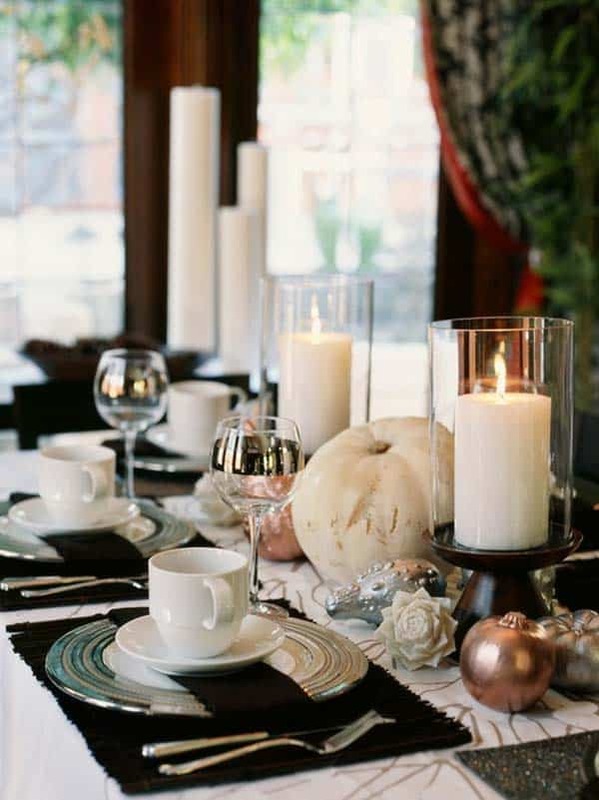 A mix of colors in chocolates, soft taupes and birch contrast nicely with a white tablecloth. 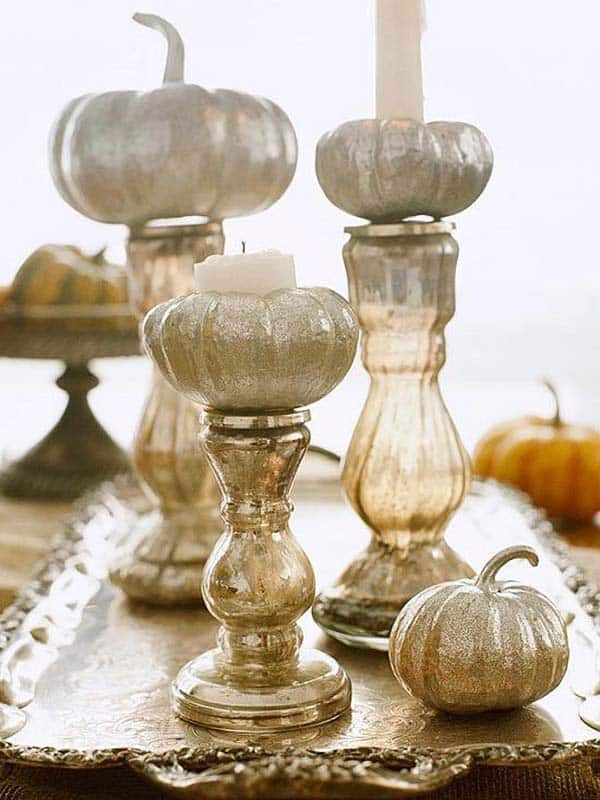 Innovative Candle Display: Set tapered candles into a unique candleholder of small white pumpkins. 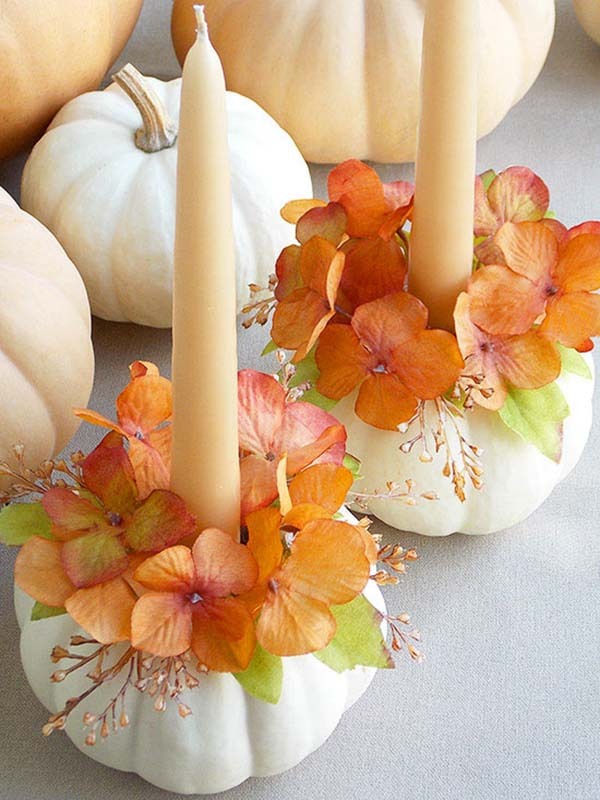 If you want permanent candleholders, DIY some faux pumpkins by hot glueing silk flowers to the tops. 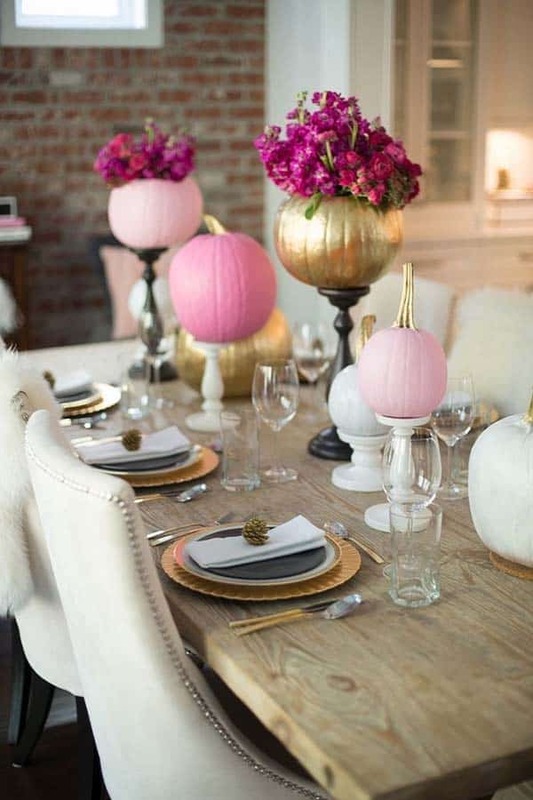 Non-Traditional Centerpiece: Create a non-traditional holiday display with some festive bright pops of color in pink. 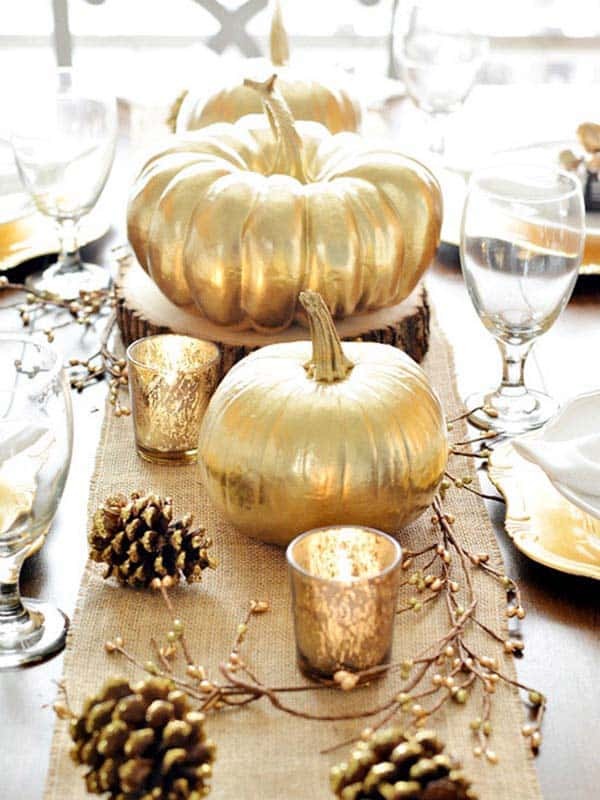 Paint pumpkins in various shades of pink and a metallic gold for some contrast. 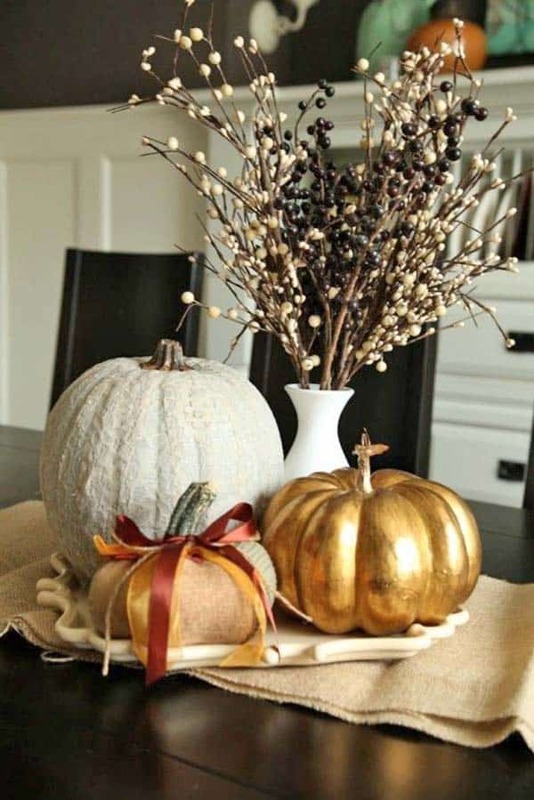 Hollow out the insides to add fresh flowers and paint the stems of the pink pumpkins in glitter gold. 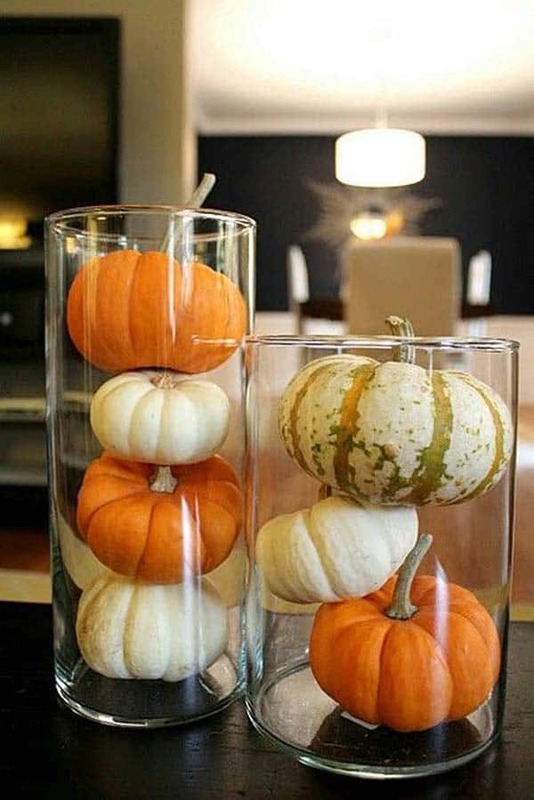 Display your pumpkins on candle holders of various heights.